Are you interested in the opportunity to visit remote places, seek adventure, face challenges, while helping deliver medical aid, training opportunities, and outreach to the nation of Papua New Guinea? YWAM Ships Newcastle is a Christian charity working with the Papua New Guinean (PNG) government to assist them to achieve their health and training outcome goals for the people of PNG. The nation’s Vision 2050 Strategic Plan aims to align their institutions and system to make ‘Papua New Guinea become a smart, wise, fair, healthy and happy society by 2050’. Indeed the nation is facing major health and infrastructure challenges. Clearly delivering basic services in Papua New Guinea poses enormous challenges as communities are scattered over rugged terrain. There are more than 1300 islands in PNG and over 600 within the Milne Bay Province alone! Infrastructures are insufficient, especially regarding transport. YWAM Ships Newcastle will partner with the PNG government to operate in PNG joining the common efforts of other YWAM entities successfully engaged within the nation for the last 8 years. 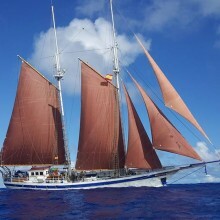 The vessel – the s/v Ruach, a 37 meters gaff-rigged schooner, with 2 masts, 24 berths and a 185 kW engine – is to be used to deliver medical supplies and services to the remoted islands of the Milne Bay Province. In addition, we build capacity through various training, including sail training. We aim to see major, sustainable quality of life, health and education improvements in the rural and hard to reach places within the Province. Simultaneously we expect seeing relationships strengthened between Australia and PNG. To achieve those goals and have a powerful impact into Papua New Guinean’s lives, we need more people to engage with us. Different opportunities are available: volunteering as Marine Professionals, donating old sails to our “Resails Program” or advocating and financially supporting our work. We would like to invite you to be part of our initiative! Our crew is coming from all around the world, providing a multicultural experience for anyone coming onboard. We do our best to provide a safe and enjoyable journey to our crew. As Chief Engineer on board the ship are representatives of our organisation, we expect a good and respectful attitude on the ship. We want everyone to enjoy the journey and have a good experience. In that way, we appreciate people who are willing to learn, share a community experience and good friendly times, serve each other and who are open to and respectful of the culture of Papua New Guinea where we're operating. The Chief Engineer holds complete responsibility for the operation of the engine room and any maintenance of machinery onboard the vessel. As head of Marine Engineering on board ship, the Marine Chief Engineer works closely with the Captain, occasionally holding equal rank, to ensure that the physical aspect of the vessel is completely under control. You must work within a small team to ensure that all maintenance is completed efficiently and in depth. The Chief Engineer must maintain inventory for any spare parts, extra fuel and oil. This inventory must be kept up to date. The Chief Engineer must also ensure that the engine room is well kept and prepared for inspection by higher authorities, and it is the Chief Engineer’s responsibility in the event that the inspection finds the room unsatisfactory. You must also determine the volume of oil, fuel and lube required for each voyage and ensure that substantial quantities of each is on board. The Chief Engineer delivers general daily operation of the engine room or to their primary assistant/s. You must minimally have an AEC or MED III with sufficient experience in both mechanics and electrical operations. The Chief Engineer must be organised to efficiently maintain the engine room and must also be able to work under pressure and within time constraints in the event of an emergency. The Chief Engineer must also be able to communicate well as part of a small team, and work cooperatively with other colleagues. You must be proficient in any software associated with engineering.